Eat. Live. Laugh. and sometimes shop! 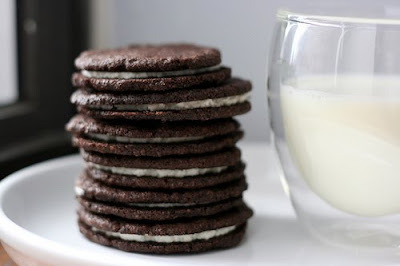 : Homemade OREOS. I've subscribed to Smitten Kitchen's blog for sometime now. I love the visual aspect of the blog as well as many of the delicious recipes and witty posts! I cannot say I've sampled many of the recipes yet, but the post on Homemade Oreos caught my eye. I was hooked. Oreos are a staple at our house. Don't get me wrong - I make homemade cookies often (actually more often than I'd like to admit), but the simplicity of an Oreo dunked in milk is simply perfect. Nonetheless, the thought of a homemade, and thus, clearly better Oreo piqued my interest. I admit, however, that I was weary, or is it, leary of trying to improve upon a classic. Would it live up to my expectations?! Would it withstand a dunk in milk?! Would my crazy-finicky children even eat them?! I stalled. The recipe lay on my counter for weeks, maybe months. I found no good excuse, but one day me and my best kitchen helper, Livi (age 7), rolled up our sleeves and threw caution to the wind. The result was delicious! Very sweet. A sugar splurge to be sure. I could have eaten the filling by the spoonful. And the wafers had a wonderful consistency - crunchy on the outside and yet still a bit chewy inside. Isn't this ultimately the sign of the perfect cookie? But do they compare? Well, yes and no. Yes, they are delicious and addictive! But no, they are not the same. In my book, they are indeed, better. Don't believe me? Well, then you'll just have to try them for yourself. Milk required.